A twist on a basic sugar cookie, these Earl Grey & lemon tea biscuits are a must-try for any tea lover. 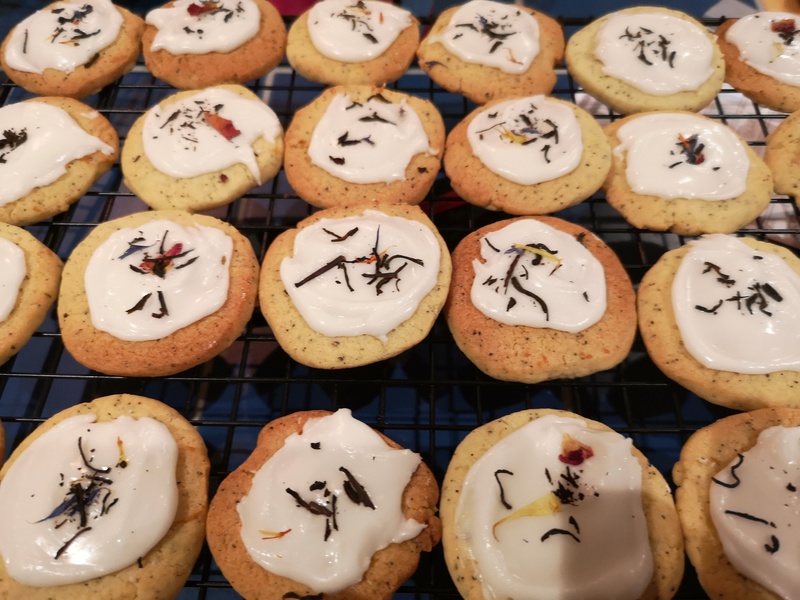 Lightly ground Earl Grey tea gives the biscuits a beautifully light, yet totally distinctive flavour, while a little fresh lemon zest brings a little punch to the mix. Topped with a light, lemon icing and sprinkled with Earl Grey tea, there’s a lot to love about these biscuits! Like all good sugar cookies these are incredibly simple to make – you just need to set aside a little time to chill the dough and roll it out! But they’re well worth the effort. Not only are the biscuits themselves deliciously flavoursome and light, but they store beautifully so you can tuck them away in an airtight container and enjoy them throughout the week. With a cup of tea, of course! The Tea Lady is one of my favourite places to get my tea fix – their little store has more varieties of tea than you can begin to imagine, and you can buy them all in beautiful little glass jars that are so pretty you’ll want to keep them out on your bench all the time. Plus, they work beautifully in baking – win! Makes approx. 48 medium biscuits. Place butter and sugar in a medium bowl and cream until light and fluffy. Add egg, Earl Grey tea and lemon zest and mix until well combined. Add flour and baking powder. Mix until a dough forms and pulls away from the sides of the bowl. Divide dough in half and shape into balls. Roll in cling film and place in fridge for 30-45 minutes. Once chilled, preheat the oven to 180 degrees Celsius. Roll dough out to approx. ½ cm thick on a lightly flowered bench. Cut into desired shapes and place on a lined baking tray. Bake for 10-12 minutes or until edges are lightly golden. Remove from oven and allow to cool on tray slightly before placing on cooling rack. In a small bowl, combine icing sugar, lemon juice and water. Mix until well combined. Add additional icing sugar if required to achieve a spreadable consistency. Spread a small amount of icing on top of each biscuit. Sprinkle with Earl Grey tea. Does this icing harden/set or does it stay soft/runny? Made this evening, soooo pretty!